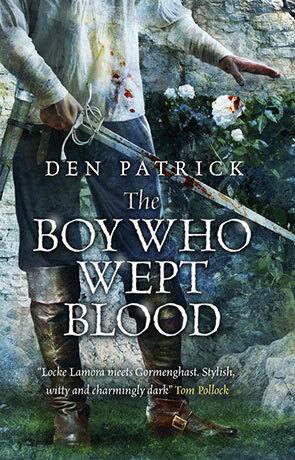 The Boy who wept blood is the sequel to Den Patrick's impressive novel, The Boy with the Porcelain Blade. Set some time after the events of the first book, the Queen Anea now rules Demense. A fairer society is being built on the ashes of the old regime however many of the old players are reluctant to give up their power. It falls to Dino to find out whats going on and hopefully put a stop to it and prevent this fledgling republic falling before its begun. It's an interesting and unexpected move to set the sequel to The Boy with the Porcelain Blade a full decade after the original events. Even more so given that the original protagonist Lucien is entirely absent. Instead Dino takes center stage and an interesting character he makes. He seems much more complex, flawed and as a result more human than Lucien ever did. It's a lot easier to relate to him. Even though Lucien is absent in the flesh, his past actions and his relationship with Dino do still play a large part. That's part of the reason why I wouldn't try reading this without reading the previous book first, consequences of the events and the founding of the characters is very important to understand. Without such understanding you won't be able to truly appreciate just what a rewarding novel The Boy who wept blood is. Of course the other reason is The Boy with the Porcelain Blade is a fine novel of charm and charisma that oozes style. This sequel though does feel a touch more refined, more confident and a natural progression. The story is highly entertaining with lots of intrigue, politics, action and some top notch fights — including impressive dueling. It's the descriptive narrative that really brings this book to life, making you feel like you are right there in the action. The tension is at times tangible, you can almost reach out and touch the characters as they weave their way through the book. The ending, when it comes all-too-soon is, while not entirely unexpected, fitting and leaves the a wide opening for the next novel in the series. The Boy who wept blood is exactly what a sequel should be, more mature and building from the previous book while moving the story forward without re-treading old ground. Highly entertaining. Written on 10th April 2015 by Ant.